U FEATURED BOUTS AVAILABLE FOR PURCHASE EXCLUSIVELY THROUGH ESPN+: (C ) JON JONES vs. (#3) THIAGO SANTOS (C) AMANDA NUNES vs.
Las Vegas – The eighth annual International Fight WeekÔ will feature a stacked card headlined by a pair of thrilling world championship fights streaming exclusively on ESPN+. Light heavyweight champion and No. 2 ranked pound-for-pound fighter Jon Jones defends against dangerous No. 3 ranked contender Thiago Santos. Also, two-division champion and No. 6 pound-for-pound fighter Amanda Nunesputs her bantamweight belt on the line against former titleholder and No. 2 ranked Holly Holm. UFC® 239: JONES vs. SANTOS takes place Saturday, July 6 at T-Mobile Arena and will stream live nationally on Pay-Per-View exclusively through ESPN+ in the U.S. at 10 p.m. ET/7 p.m. PT in both English and Spanish. ESPN+ is the exclusive provider of all UFC Pay-Per-View events to fans in the United States as part of an agreement announced last month and continuing through 2025. Fans will be able to purchase UFC® 239: JONES vs. SANTOS online at ESPNPlus.com/PPV and then will be able to watch it via the web or on the ESPN App on any connected device. ESPN+ is available as an integrated part of the ESPN app on all major mobile and connected TV devices and platforms, including Amazon Fire, Apple, Android, Chromecast, PS4, Roku, Samsung Smart TVs, X Box One and more. Arguably the most dominant champion in UFC light heavyweight history, Jones (24-1 1NC, fighting out of Albuquerque, N.M.) will go for his third title fight victory in less than seven months. Over the course of his career, he’s taken out the biggest names in MMA. Jones holds spectacular wins over Daniel Cormier, Quinton ‘Rampage’ Jackson, Shogun Rua, Lyoto Machida and Alexander Gustafsson (twice). He once again aims to steal the show against one of the division’s toughest strikers. Tickets for UFC® 239: JONES vs. SANTOS go on sale Friday, April 19 at 10 a.m. PT. Tickets are available for purchase online at www.axs.com. Ticket sales are limited to eight (8) per person. UFC Fight Club® members will have the opportunity to purchase tickets Wednesday, April 17 at 10 a.m. PT via the website www.ufcfightclub.com. A special Internet ticket pre-sale will be available to UFC newsletter subscribers Thursday, April 18 starting at 10 a.m. PT. To access this presale, users must register for the UFC newsletter through UFC.com. Houston police have released surveillance photos of a suspect wanted in the death of a man at 3801 Liberty Road about 11:55 p.m. on Tuesday (April 16). The suspect is described only as a black male in his early 20s who goes by the name “Colombia.” He was wearing a red, white and blue FILA jacket and is believed to be driving a gray 2006-2008 Dodge Charger with no front license plate. Surveillance photos of the suspect, including one with him holding a metal pipe are attached to this news release. The victim has been identified as Terry Calhoun, 46. Mr. Calhoun was inside a neighborhood store at the above address by the front counter when an unknown suspect entered the store with a metal pipe (not a stick) in his hand. The suspect approached Calhoun and struck him in the head at least once. Paramedics transported Calhoun to Lyndon B. Johnson General Hospital where he was pronounced deceased. At this time, there is no known motive. Anyone with information in this case or on the whereabouts of the wanted suspect is urged to contact the HPD Homicide Division at 713-308-3600 or Crime Stoppers at 713-222-TIPS. Young musicians are invited to showcase their talent at an upcoming Houston Health Department competition. 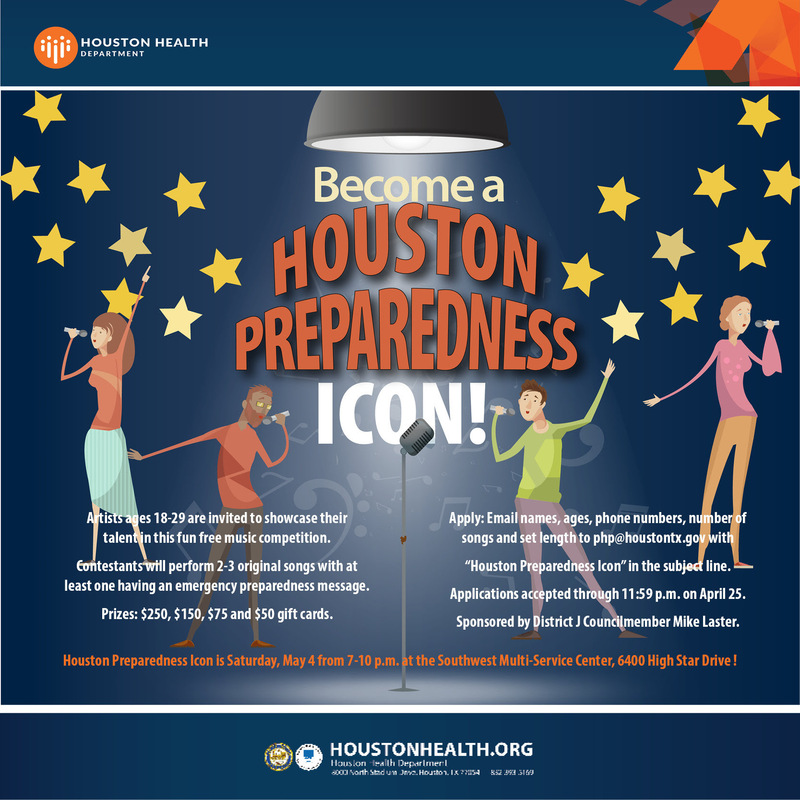 Houston Preparedness Icon offers contestants ages 18-29 the opportunity to win prizes for writing and performing songs that encourage Houstonians to prepare for emergencies. To apply, email the name(s) of contestants, ages, phone numbers, number of songs and length of set to php@houstontx.gov with “Houston Preparedness Icon” in the subject line. Houston Preparedness Icon will be held Saturday, May 4 from 7-10 p.m. at the Southwest Multi-Service Center, located at 6400 High Star Drive in Houston. Free tickets can be obtained at https://www.eventbrite.com/e/houston-preparedness-icon-tickets-60277493606. Charges have been filed against a suspect arrested in the shooting of a juvenile male and a woman at 9050 Mills Road about 2:30 a.m. on Saturday (April 14). Charges have been filed against a suspect arrested in a fatal crash at 1801 South Voss Road about 6:05 p.m. on Monday (April 15). The suspect, Julivan Do Tran (A/f, 29), is charged with manslaughter in the 184th State District Court. A booking photo of Tran is attached to this news release. The identity of the female victim, 33, is pending verification by the Harris County Institute of Forensic Sciences. The victim, operating a green Harley Davidson motorcycle, and suspect Tran, driving a gray Honda Accord, were involved in an earlier crash in which the victim left the scene and failed to stop and give information. While Tran was waiting for police officers to arrive to take a report, she saw the victim on the motorcycle and the two had a conversation. The victim then left the scene a second time. Tran then got into her vehicle and began to chase after the motorcycle behind the business at the above address. When the motorcyclist lost control going around a corner of the business, Tran failed to control the speed of her vehicle and struck the motorcycle. Paramedics transported the motorcyclist to Memorial Hermann Hospital where she was pronounced deceased. Tran was taken into custody and subsequently charged in the incident. WBO welterweight champion Terence “Bud” Crawford and Amir “King” Khan hosted a media workout today at EverybodyFights, as the pair prepares for Saturday evening’s Top Rank on ESPN PPV showdown at Madison Square Garden. The stacked undercard will feature a pair of highly anticipated co-features: Lightweight sensation Teofimo Lopez will fight Edis Tatli in a 12-rounder, while featherweight phenom Shakur Stevenson will face former world title challenger Christopher Diaz in a 10-rounder. In the 10-round televised opener, Felix Verdejo seeks to return to lightweight contention versus former interim world champion Bryan Vasquez. Here is what the PPV fighters had to say. Concacaf Anuncia Detalles de la Etapa Preliminar de la Clasificatoria Olímpica Masculina de ConcacafLa fase de clasificatoria comenzará en 2019 con las eliminatorias regionales en Centroamérica y el Caribe Miami (martes, 16 de abril de 2019) – La Confederación de Norte, Centroamérica y el Caribe de Fútbol Asociación (Concacaf) anunció hoy los detalles de las rondas preliminares de la Clasificatoria Olímpica Masculina de Concacaf. Los clasificatorios regionales comenzarán este verano, con partidos en Centroamérica y el Caribe. Para ver y descargar el calendario completo de la Copa Oro 2019 de Concacaf, visite este enlace. Los boletos para todos los partidos de la Copa Oro están disponibles visitando www.GoldCup.org. Los aficionados pueden obtener más información sobre la hospitalidad previa al juego y los paquetes de viaje para los juegos de la Copa Oro visitando www.Primesport.com.